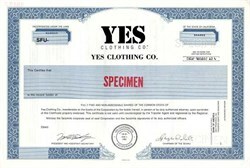 Beautifully engraved SPECIMEN certificate from the Yes Clothing Company. This historic document was printed by Thomas de la Rue and has an ornate border around it. This item has the printed signatures of the Company's Officers. Yes Clothing Company, Inc, was the maker of Yes jeans. The Company has been out of the apparel business for several years now, curtailing operations in July 1997 due to lack of trade credit and working capital. In December 1977, Yes filed for protection under Chapter 11 of the Bankruptcy Act and abandoned the clothing industry. At the end of September 2001, the Company had no assets and there had been no revenues since 1998.